In case of Emergency when working on Quartz Watches. 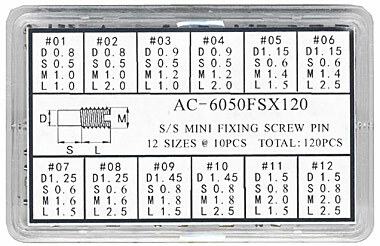 This assortment of 10 different types of screws in assorted sizes will save your day. 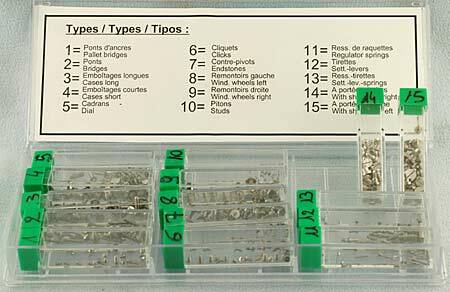 At the tip of your tweezers you'll have Bridge Screws, Setting Lever and Minute Train Cover Screws, Date Indicator Guard Screws, Case Screws 1/2 Head, Case Screws Round Head, Circuit Screws, Coil Screws, Coil Guards and Stators Screws, Battery Clamp Screws, Battery Clamp Screws With Shoulders. A total of 240 time saving and job saving screws! Swiss Made. 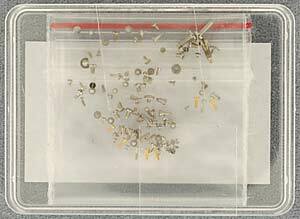 1 gross assorted screws for wrist watches. Swiss Made. 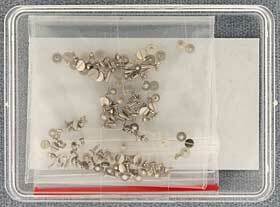 1 gross assorted screws for pocket watches. Swiss Made. 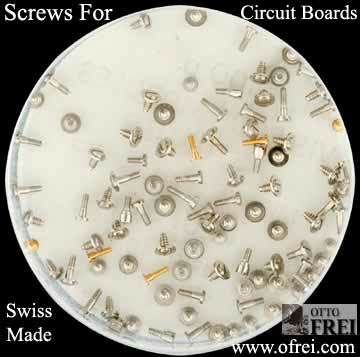 100 pieces of assorted screws for quartz watches. 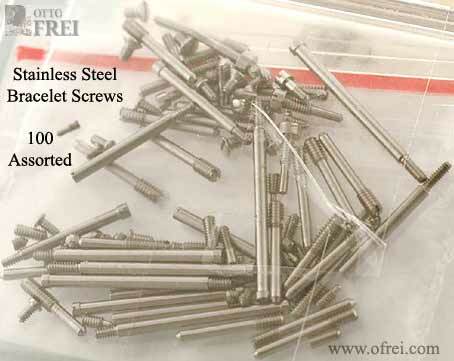 Assortment of 36 dozen screws in 15 compartments of different types of screws. 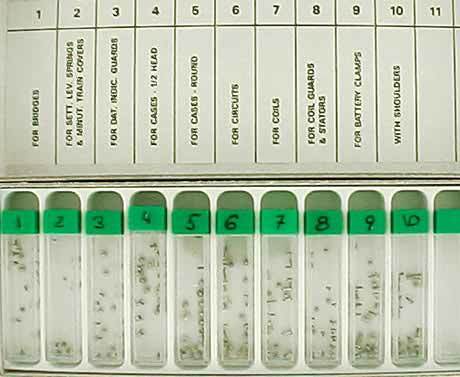 In each compartment you will find different thread diameters and lengths. 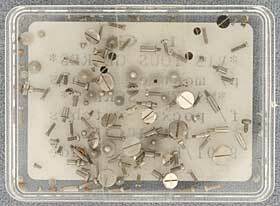 Assortment includes screws for: pallet bridges, bridges, thick cases, thin cases, dials, clicks, endstones, left winding wheels, right winding wheels, studs, regulator springs, set lever springs, with shoulders right, with shoulders left. The expandable jaw automatically grips any size or shape of lock nut, hex nut, star nut, cap nut, or round nut. The Nut and Screw Grabber doubles as a screw starter! Placing a screw in the self-closing jaws makes it easy to thread even the smallest screw into the hardest to reach place. The more pressure you apply, the tighter the grip on the screw. Strong loosening fluid for screws. 6cc Syringe. 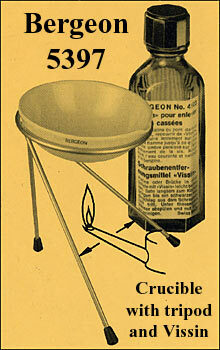 The complete set includes the crucible, tripod and Vissin (50ml). 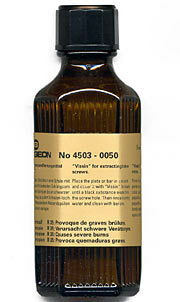 Bergeon Vissin solution is specially formulated for removing broken screws, 50 ML. Very simple to use and rapid with results. The substance needs heating with the damaged part of the screw in the liquid as heat is applied. 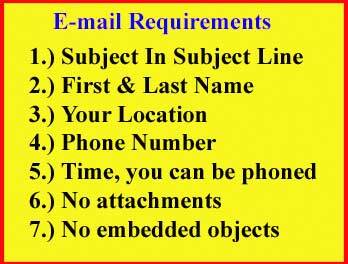 Simply place a plate or bridge in a recipient and cover it with Vissin. Boil slowly until a black substance exudes from screw hole. Rinse in water and clean with benzine. 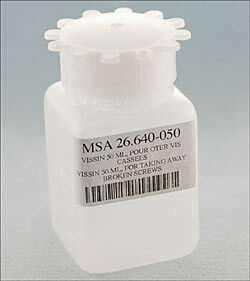 Vissin solution is specially formulated for taking away broken screws, 50 ML. Very simple to use and rapid with results. The substance needs heating with the damaged part of the screw in the liquid as heat is applied. Container measures 35 x 35 x 70 mm. 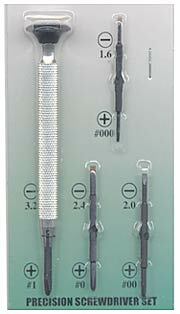 Precision screwdriver set with reversible phillips and straight blades. 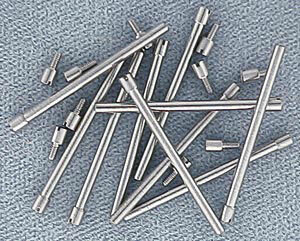 Phillips size #000, #00, #0, #1; Straight size 1.6, 2.0, 2.4, and 3.20 mm. 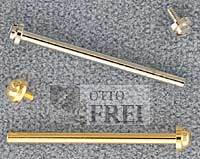 For recovering small metal pieces. This paper component-collector is tearproof and washable. Easy use and cleaning. Consisting of 2 double-sided magnet straps. Supplied flat. Folded dimension: 285 x 82 mm. Comes in package of 1.